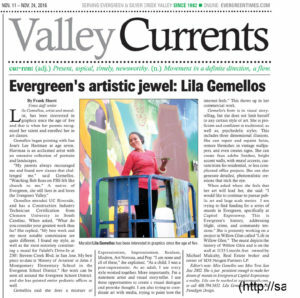 “Life in Willow Glen”, my latest project, is larger than life and based on both Willow Glen’s rich heritage and vibrant present cultural. 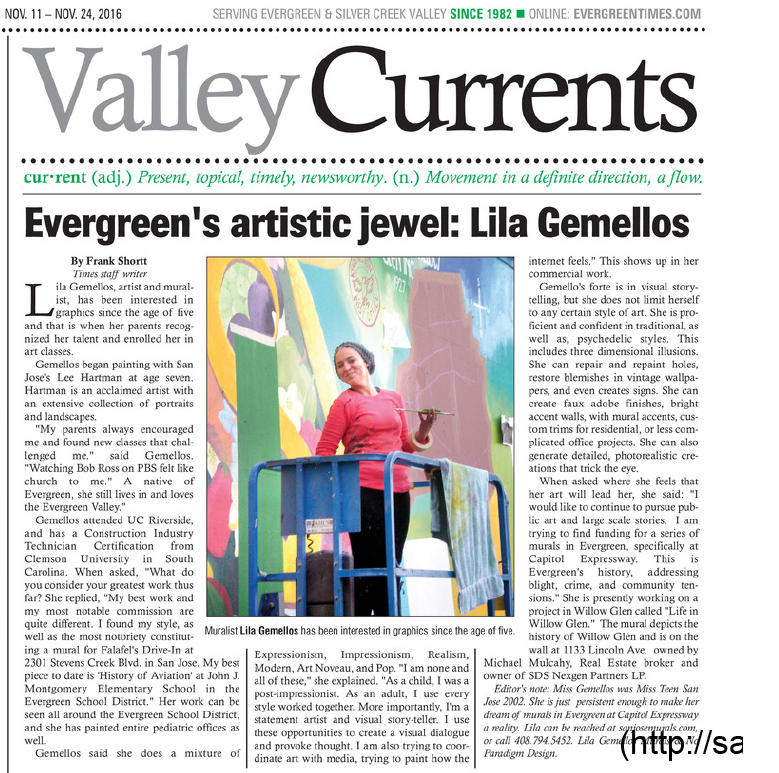 In fact, the title is based on Bud Lima’s movie with once played on the screen of the Garden Theater between features, later preserved by the Willow Glen Business Association. 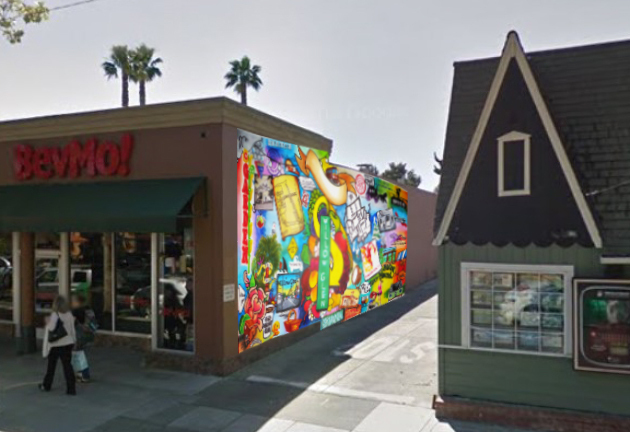 Located at 1133 Lincoln Ave, this mural takes audiences on a trip through time through Willow Glen. It is an idea I’ve been tempted with for a long time, using history and street art together to say something more inspired about the place we live. 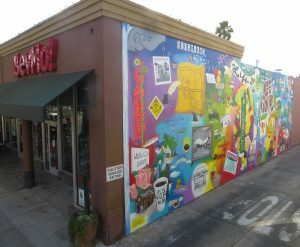 As the artist, I researched and designed this mural, with input from the property owner and Willow Glen native, Michael Mulcahy, contributions from the Willow Glen Business Association and local experts. 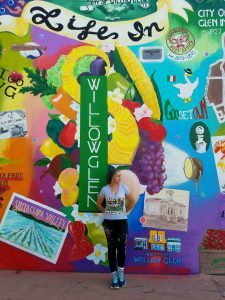 Here represented in the mural are Willow Glen’s past and present business culture, its fruit industry, its iconic neon, its cartography and civil history, family photos, present visions and classic Willow Glen memories. 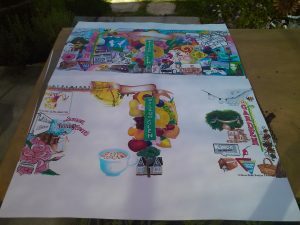 This was a collaborative design process with plenty of drafts and mock ups. I must’ve done an alright job because people kept asking who designed it and said I must be from Willow Glen, which I’m not. Throughout the process, I was giving history tours through my painting. It’s a nerdy artist’s dream to program towards people’s sentiments and then provoke intrigue. 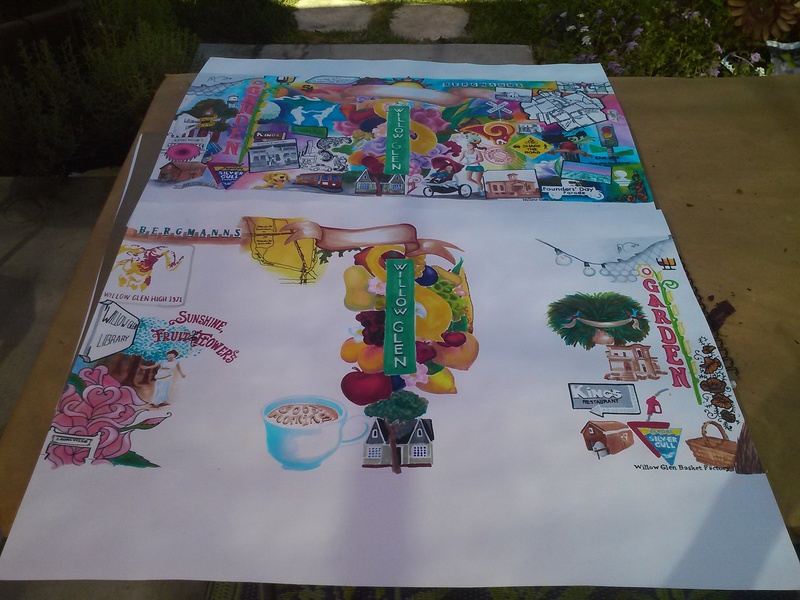 Also my largest project to date, in square footage and in scale, I consider this piece Proof of Concept for past and present iconography, especially in San Jose. 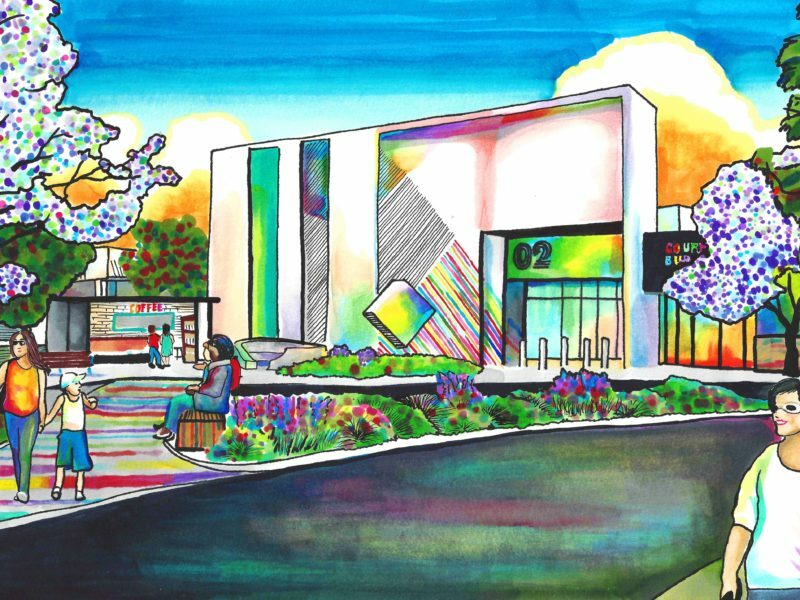 It’s an exceptional pleasure and honor to add to Willow Glen’s public art scene, all thanks to Mr. Mulcahy for bringing me to the contract. We welcome people in with the page of a book, coffee and a life size puppy, but we capture people with the story of Willow Glen. What separates this mural from Willow Glen and District 6’s current art portfolio is that it is an engaging, interactive mural that begs viewers to stop. Young and old, people are moved to stop and wonder. 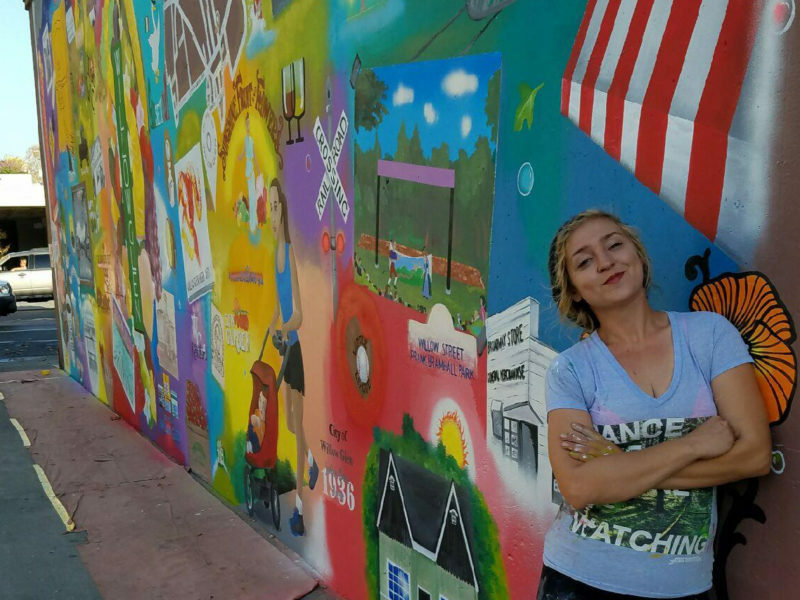 The mural either beg consideration of the history and viewers to find their own connection, or begs to take a photo in front of several perfect backdrops found within the mural. This is the first project I’ve created with its own unique hashtag, #lifeinwillowglen. This occurred to both the property owner, Michael Mulcahy, and I when people were interacting with the mural at only 50% completion. This project will also have an online presence greater than a single hashtag. 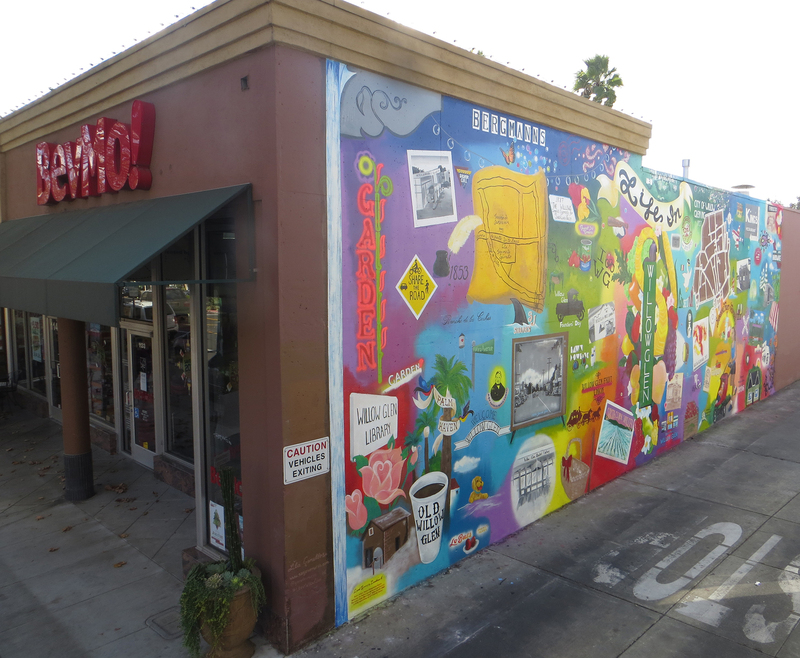 Later development of the parcel will make this mural and the Willow and Lincoln corner more accessible. Once completed, the construction will open up to a much larger angle and draw people to a new patio seating area. 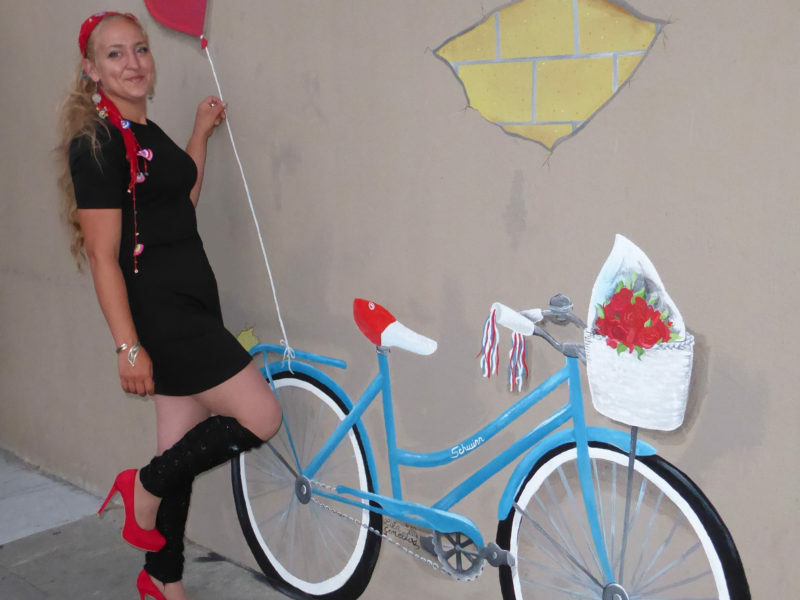 For this reason, this mural is a perfect opportunity to continue engaging with the public. By using the strength of that rich heritage and vibrant present cultural, this mural can add to the story weekly, drawing the return visit from locals. A QR code will open an audio file that explains different portions of the mural and fund its extension or an addition elsewhere. This is an opportunity to find out if Public Art can be sustainable and continuously engaging. See the attached press for the project and enjoy the progress gallery below. Your narratives are thoroughly competent and artwork divinely inspired.